Is an E-mail the Best Tool for Event Communication? As an event organizer, trying extra hard to engage your attendees before, during, and after your event might be a familiar situation. You might take the time to customize e-mails and make engaging e-mail subjects… only to discover that 20% attendees opened your emails! If you think about the huge amount of emails people get everyday this makes sense. It’s just too likely that your e-mails will get lost forever in a cluttered email box. This should make you wonder, is there a better alternative to emails that has been proven to be the best for event communication? What exactly is Event Communication? Before, we get any further let’s define event communication first. It can be broken down into two types. One is communication with attendees, including event promotion, pre-event engagement, onsite announcements, and post-event follow ups. Another type is communication within your organizing team, consisting of those frequent check ups with your team on their goals, tasks, and schedules. Are Push Notifications through an Event App Enough? A top-notch event app has the functionality to allow you to send out push notifications to attendees. It is a good additional communication channel connecting organizers and attendees as people tend to check a notification coming from their cell phones more often. Unfortunately, the announcement feature on the majority of the event apps are either inconvenient or are limited by the mobile environment. You might find it hard to type on a mobile device during a time crunch on the day of your event. Also, you might prefer sending out emails with a concern that not all people have downloaded the app, or as you want to include more detailed information including pictures, urls, or highlights. Several hundreds of events has used Whova’s new announcement system since we released it 2 months ago. 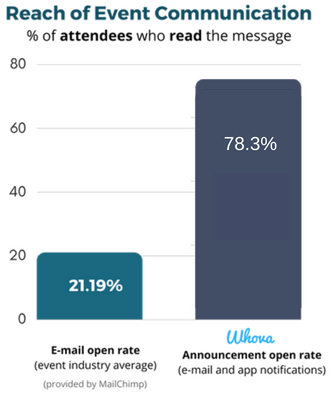 We observed that the open ratio of an organizers’ message through Whova was 78% on average, significantly higher than the average email open rate in the event industry (21%, reported by MailChimp). 94% of the event organizers said it was very useful to increase attendee engagement and effectiveness of the organizing team’s collaboration; the others (6%) said their events simply didn’t need to use announcements due to the event size and length, etc. The Whova platform allows your announcements not only to be sent through the Whova app’s push notifications but also via e-mail at the same time. It’s convenient for busy organizers because there’s no need to create a separate email campaign on a different emailing system. Most importantly, like other events that used Whova, you will be able to have the majority of your attendees (> 70%) open your messages with the two communication channels so that you can engage them further. For example, you can better encourage attendees to submit surveys or live polling as well as make instant updates on room changes without worrying about missing certain people. Have you ever been so busy that you just forgot to send an important announcement? Don’t worry, because Whova gives you the power to set a date and time for your announcements. Schedule instructions for VIPs the day before your event, reminders for mobile surveys to submit at the end of the event, a to-do list for your team in the morning to keep them on track, and much more. Create announcements that are engaging and get your point across. Use different colors, highlights, pictures, and links to bring attention to certain information by using a convenient html editor on Whova web dashboard. For example, you can send a map in an announcement to serve as a visual for attendees to know where to park and how to get to the venue. You can even provide directions that are bolded for easy navigation. With Whova, you can even select what specific group of attendees you’d like to see your announcement. For example, by specifying announcement recipients to be speakers, you can provide them with more guidance as to when they should arrive to their session and what route they should take. This can also apply to collaboration with your event organizing team. Send out a quick to-do checklist exclusively to them to keep them on track! You can send out announcements either from the Whova web dashboard or directly from the app. Whova provides templates useful for common event situations such as room or session reminders, so it further saves you time. While e-mail alone might not be the best method of communication, push notifications on a mobile app will help your announcements reach more of your attendees. Sending announcements via Whova allows you to use rich formatting and a variety of features such as scheduling so you can engage your attendees more effectively and conveniently communicate with your event organizing team. 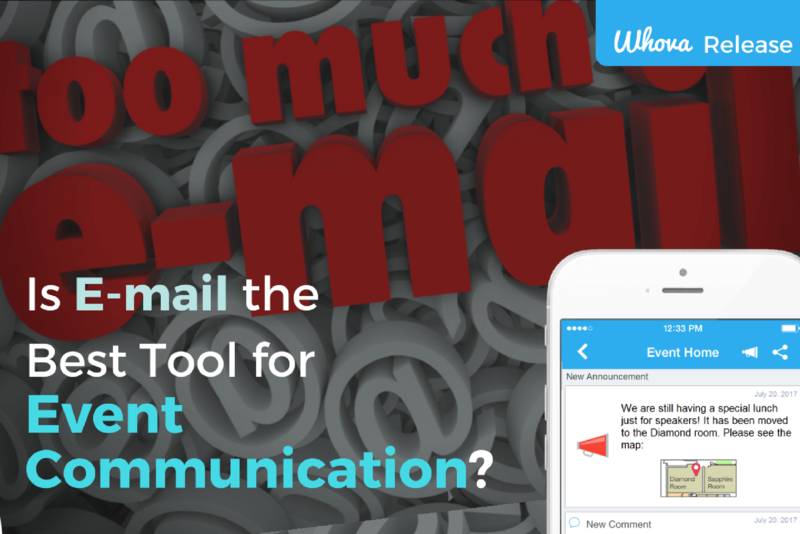 Interested in improving your event communication with Whova? Contact us here!